The rainbow wave of last year’s midterm election is still resounding — as a record number of out LGBTQ lawmakers take their seats in state, local, and national offices, a record number are gaining leadership positions in state legislatures. The midterms saw more than 150 out candidates elected at all levels of government, according to the LGBTQ Victory Fund, which endorses and works to elect such candidates. That brings the total to 680 in state bodies, local offices, and Congress, Victory Fund notes. And at the start of the 2019 legislative session, seven out LGBTQ lawmakers were chosen for state-level leadership positions, bringing the total to a historic high of 17. 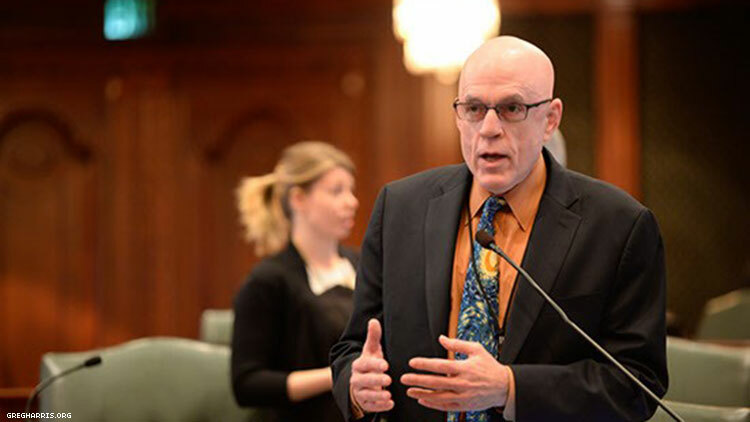 The Advocate recently spoke with one of them, Rep. Greg Harris of Illinois, and will be catching up with other political trailblazers in the near future. A gay man from Chicago, the Democrat was named House Majority Leader in January by Speaker Mike Madigan, making him second only to the speaker in the House hierarchy. Harris is the first out lawmaker to hold that position. Harris was previously an executive for a trade association and chief of staff to a Chicago City Council member. He first became involved in politics in the early 1990s, during the height of the AIDS crisis. Like most gay men, he notes, he saw people dying all around him. “That’s when a lot of us got going,” he says. Harris is HIV-positive himself; it’s unclear if he’s unique among legislative leaders in that regard. Neither being gay nor being HIV-positive has impeded his political career, Harris says. “I think I’ve been very fortunate,” he says. As majority leader, he’ll help set legislative priorities and advocate for key causes. One of them is improving access to affordable health care, something that’s important to LGBTQ and HIV-positive people as well as other demographic groups. “My number 1 job,” he adds, “is restoring fiscal stability and confidence” in Illinois, which during Republican Gov. Bruce Rauner’s tenure went without a complete budget for more than two years due to an impasse between Rauner and the Democratic-majority legislature. Other states that recently elevated LGBTQ lawmakers to leadership positions are Maine, Michigan, Nevada, North Dakota, and Oklahoma, according to Victory Institute. The Maine House of Representatives has a two-fer – Matt Moonen and Ryan Fecteau were elected majority leader and assistant majority leader, respectively, “making Maine the first state in the nation to have a legislative chamber led by a gay duo,” notes a Victory Institute blog post. Like the other legislative leaders, they’re Democrats. In Nevada, Kelvin Atkinson was elected Senate majority leader, making him the first out gay African-American to hold a legislative leadership post anywhere in the nation. In Michigan, Jeremy Moss, the first openly gay person elected to the state Senate, was named assistant minority leader. Kay Floyd was elected minority leader of the Oklahoma Senate, making her Oklahoma’s first woman and first LGBTQ person to serve in leadership. And in North Dakota, Josh Boschee was elected House minority leader.